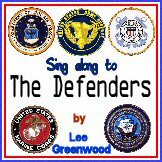 U.S. Air Force Blue Sing-Along Wave file with choir by Brownielocks. Written by a Raymond Scott and Keith Textor. Used by US Air Force in 1950's recruiting television commercials. And a touch of Old Glory's hue. The U. S. Air Force Blue! We're a rugged and ready crew. To U. S. Air Force Blue! We know where we're going. The sky's no limit in the Air Force! And, a touch of Old Glory's hue. Rifle Spinning Animation to "Semper Fidelis"
A large wave file. It's a tribute to all the military branches, and our reserves. Want to hear other songs? Go to our main patriotic song page listing. Check out our 60's Protest Songs Page also. Military animation were public domain.